Quinoa is one of the world's most popular health foods today as it is naturally rich in protein, vitamins, minerals, fiber, and antioxidants. You can add more nutrition to your baked goods and pancakes by using 100% organic quinoa flour – try Biofair Organic fair Trade Organic Quinoa Flour. Quinoa is one of the few plant foods that feature a complete amino acid profile. It delivers all 9 EAAs (Essential Amino Acids) that are needed for the growth, maintenance, and repair of lean muscle tissue, making it an ideal source of protein for vegans and vegetarians. Biofair Organic Fair Trade Organic Quinoa Flour is loaded with good amounts of dietary fiber that will promote excellent digestive function and provide relief from constipation. You also get loads of vitamins and minerals that will promote excellent whole body health and general wellness, plus antioxidants that will neutralize free radicals and delay the onset of aging on your body. 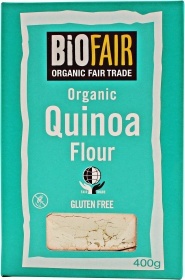 You may use Biofair Organic Fair Trade Organic Quinoa Flour as a baking ingredient for making muffins, brownies, pancakes, and many other baked goods. Add more nutritional value to the food you eat and enjoy better daily health – try Biofair Organic Fair Trade Organic Quinoa Flour today! Have a question about Organic Quinoa Flour? What is it, what does it do, how and when to use or something else? Ask us. “Organic Quinoa Flour 400g” is currently out of stock. Enter your details below and we will let you know when it's back in stock.